WEDNESDAY, Sept. 12, 2018 -- They say lightning never strikes twice, but once is enough for the 47 people it kills in the United States each year. The National Weather Center calls lightning "an underrated killer, hotter than the surface of the sun." According to University of Nebraska Medical Center researchers, Nebraska alone sees an average of 773,000 lightning strikes per year. Everyone who is outdoors during a lightning storm needs to take precautions, says John Jensenius, a University of Nebraska lightning safety specialist. "Keep in mind that if you can hear thunder, you're close enough to be struck by lightning," Jensenius said in a medical center news release. Don't wait to hear thunder before taking shelter, he stressed. Lightning can strike 10 or more miles within the area of a thunderstorm, he said. Also, it's not metal that attracts lightning, it's the tallest objects. It could be a tree, a fence, the ground or a person. A lightning bolt can have enough power to keep a 60-watt bulb lit for six months and cool a refrigerator with an open door for 24 hours, Jensenius said. When lightning strikes, the power it contains radiates from the center outward. So it could injure or kill a person close enough to be in its path. "A lightning bolt will follow routes like gas and water pipes, electric lines, phone lines, cable TV, internet lines, gutters, downspouts, metal window frames -- anything that conducts the electrical power," Jensenius said. Because water conducts electricity, you should stay out of the shower and bathroom during a lightning storm, he added. In addition, lightning can start fires. It can easily ignite wood and other flammable materials, and when lightning travels through electrical wires, it burns them up, creating a fire anywhere along the electrical system. Moreover, power surges from lightning can damage electronics or generate a shock wave that fractures concrete, brick, cinderblock and stone. Lightning often damages brick and stone chimneys. 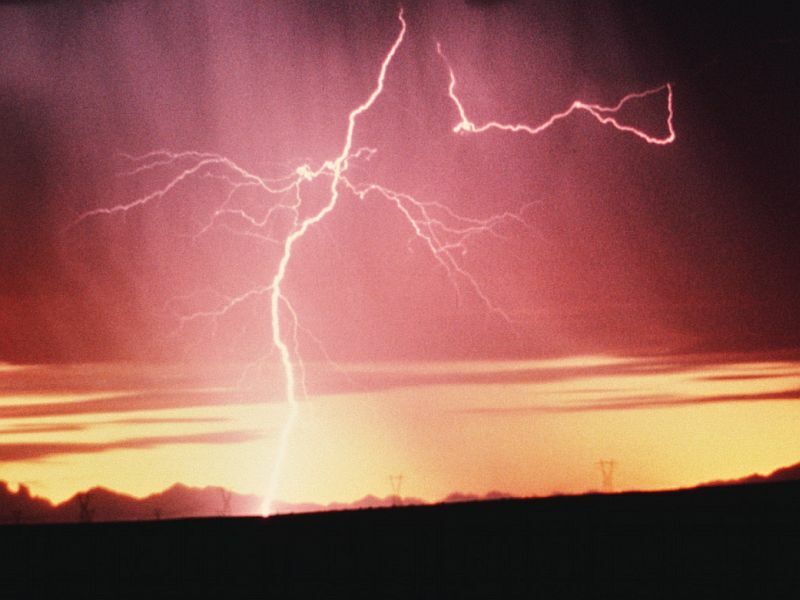 Lightning can be strong enough to blow holes in plaster walls, shatter glass, create a trench in the ground and crack foundations, Jensenius added. Washing machines are especially dangerous because they have electricity and plumbing. "Landline telephones are also hazardous, but cellphones and wireless phones are safe," he said. Lightning can move through the ground and across wet, damp concrete, so avoid direct contact with the ground. And if you're in a basement, garage or patio, wear shoes. If a building is struck by lightning, call the fire department, even if you don't see smoke or flames. Protect electronics by unplugging them. Surge protectors and UPS units won't provide direct-strike protection. If someone is struck by lightning, call 911 immediately. Finally, don't stand outside and watch storms, Jensenius said. "Listen to your local forecast and always plan ahead so there's a safe place to go in the event of a storm. And stay inside for 30 minutes after you hear the last thunder. That allows the storm to move on, and you won't have to worry about lightning," he said. The U.S. National Severe Storms Laboratory has more on lightning.